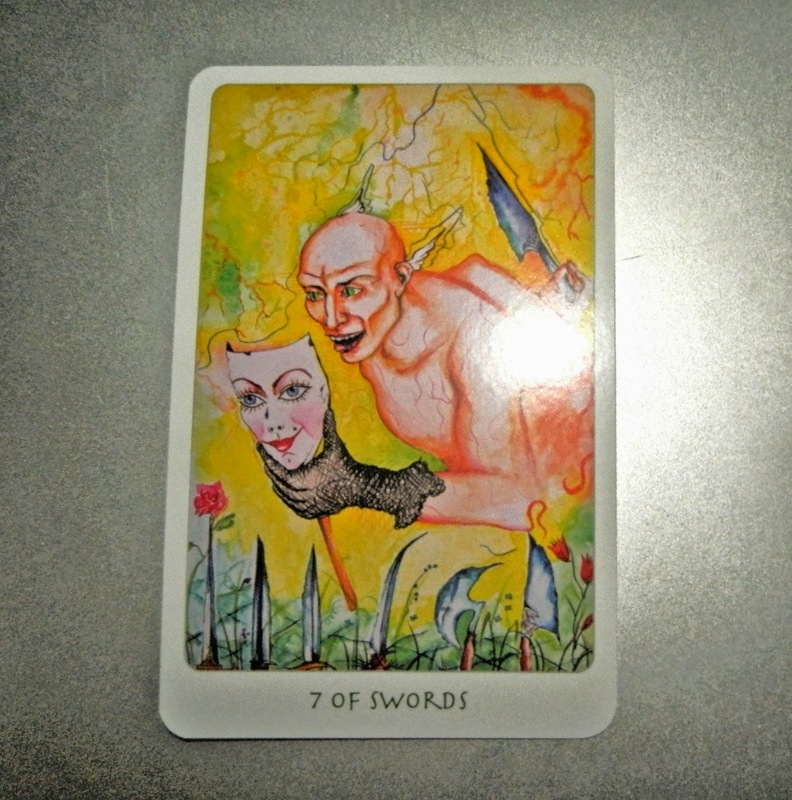 Today's Draw: Seven of Swords from the Clover Tarot. In what ways are you betraying yourself right now? What is the payoff for that betrayal? And what are the consequences? The Clover Tarot is a new deck with some interesting imagery. I believe the deck comes from Latvia or someplace around Russia, because the website seems to be written in Russian and the URL to purchase it seems to suggest Latvia. Wherever it came from, the card stock is nice, the imagery is non-traditional (like I like it) and the book is quite comprehensive, giving a description as well as meanings for both upright and reversals. In fact, something written in the description is what gave me inspiration for today's blog. It says the demon is "burning and betraying himself in his own greed." This idea of "burning and betraying ourselves" for something we want or for some excess is an interesting thought. It immediately brings me back to my dating years where I acted all sweet and polite, only to end up with some guy who was looking for a sweet and polite girl and got me instead. It's no wonder the relationships didn't last long...haha. Right now I have a recruiter wanting to talk to me about some work in Richmond and it just doesn't feel right. I told him he could call me, but I'd be betraying myself to talk to him. It doesn't feel right. And this morning I was at Starbucks after a doctor's appointment and I usually get a cinnamon scone, seeing as how I only go every three months. But I realized that, though "cinnamon scone" was who I used to be, "steelcut oatmeal" is who I am now that I have diabetes. I made the right choice and didn't betray myself. If you're on the same path I am, you want very much to move through life as your "authentic self". But that's a hard thing to figure out. At least it has been for me. Partly because I have an authentic self and then I have an "aspirational authentic self". For example, my authentic self is probably still cinnamon scone. But my aspirational authentic self—the authentic self I'm becoming—is steel cut oatmeal. So that's makes things a little confusing. And another thing that makes things confusing is that we all have facades and behaviors we use to get by in the world. So, as a business person, I should never turn down hearing out an opportunity like with the recruiter. But my emotional authentic self is moody and fickle as far as that goes. And my authentic psychic self is at odds with this opportunity. So considerations get very complex very quickly with all the authentic selves clamoring to make the decision. When I first started search for my authentic a long time ago, I had a lot of trouble even knowing what that was. We're conditioned to be certain ways by our upbringing. Like growing up, our house was always neat. So me being authentically messy and cluttery is a constant struggle. It suits me to have crap laying about...haha. But there's that voice in my head that says I'm "bad" for being less than sparkling. On another note, about 20 years ago or so I had piled on so much as far as appearances and such was concerned that I completely lost track of my soul. When I was ready to leave that phase of my life, it was hard to find what was real in the sea of '90s glam I'd been swimming in. I managed to dig out of that and find more authentic substance in my life, but I know that, for a while, I was a sheet flapping in the wind, not knowing what was true to me and what was not. So there are many ways in which we betray ourselves. And some of the ways in which we betray ourselves happen on the way to finding ourselves. So it's not wasted energy. But it is something to be cognizant of. Because whether we do it for money, love, gluttony, fashion, acceptance or just out of habit, each time we betray who we really are and who we want to be, we make it that much easier to betray ourselves the next time. And we invite betrayal to us through mirroring as well as by clouding our own vision, making betrayers hard to see. Our betrayal burns us. We can spend a lifetime masking and fighting against who we are to suit some vision of who we "should" be, only to find that the peace and happiness we ultimately seek—along with the acceptance and consideration we want from others—comes from living fully in all our moody, fickle, steelcut glory.